In order to provide Scouts of Southeast Louisiana Council a quality Scouting Program, the Council Advancement Committee and District Advancement Committees have collaborated to generate a comprehensive Approved Merit Badge Counselor List. 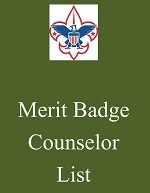 To utilize the Merit Badge Counselor List, a User ID and Password is required. You can obtain a User ID and Password by contacting your District Advancement Chairperson or a member of the Council Advancement Committee. If you have a User ID and Password, click below to log in and search the list. If you have any questions, feel free to contact David Leroux, Council Advancement Chairman. If you wish to register to be a Merit Badge Counselor, please click the link below.